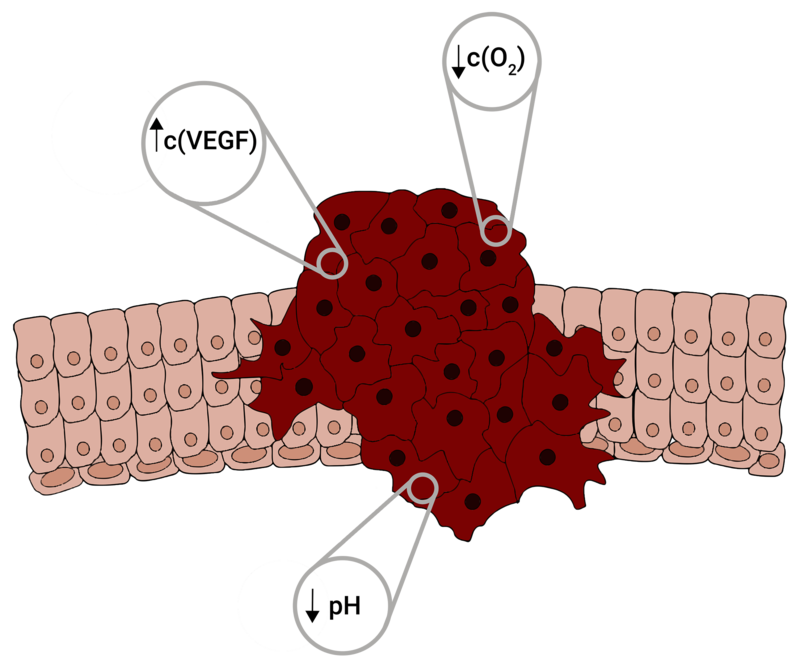 Tumor microenvironment (TM) refers to the cellular environment surrounding a tumor, which includes blood vessels, normal cells and molecules. The interaction between a tumor and its microenvironment results in different physiological processes providing both beneficial and adverse consequences for tumorigenesis (Quail & Joyce, 2013). Generally speaking, gene expression is altered in tumor cells leading to the secretion of various molecules such as cytokines, growth factors, and cellular components, for instance, exosomes to recruit stroma and vascular cells (Quail & Joyce, 2013; Mittal et al., 2014). Additionally, various immune effector cells can also be found in the tumor microenvironment, yet their anti-tumor functions are downregulated due to tumor-derived signals such as cytokines (Whiteside, 2008). There are several factors which are altered in comparison to the healthy interstitium. In the following we will highlight and describe some of the major factors. In the tumor microenvironment the levels of VEGF (vascular endothelial growth factor) are increased, while the extracellular pH as well as the oxygen concentration decrease, which creates an acidic and hypoxic environment. One of the key characterisitics of tumors is their fast growth, which in turn leads to a lack of oxygen, termed hypoxia (Yotnda et al., 2011). Hypoxia (Fig. 1) is a constantly evolving participant in overall tumor growth (Patel & Sant, 2016; Kim et al., 2009) and remains the predominant regulator of angiogenesis in the tumor microenvironment (Mittal et al., 2014). The actual physiological level of oxygen in healthy tissues ranges from 3-6 % (Tian & Bae, 2012), while that of tumors is approximately 1 % (McKeown, 2014), which can be an important factor to distinguish healthy tissues and tumors. To overcome this oxygen limitation, tumors typically induce angiogenesis to generate its dedicated blood supply for oxygen and other nutrients. To do so, it secretes various growth factors, including vascular endothelial growth factor (VEGF). VEGF (Fig. 1) promotes growth of blood vessels and is regarded as constituent element of the tumor microenvironment (Mittal et al., 2014). In addition, acidic extracellular pH (Fig. 1) is a major feature of tumor tissue due to lactate secretion from anaerobic glycolysis and CO2 from the pentose phosphate pathway (Kato et al., 2013). Studies on different tumor nodules in human patients reveal an average extracellular pH of 7.0, in contrast to the physiological pH of 7.4 (Tian & Bae, 2012). Those factors that determine the nature of the tumor are considered by most therapeutic approaches to develop targeted therapies. Hypoxia, low pH and VEGF are three common characteristics of the tumor microenvironment. Therefore, we chose these conditions to control the expression of chimeric antigen receptor (CAR) in T cells by an AND gate.